Last database update: 23 April at 10:32 - Around 230000 files indexed. Unit testing is one of the processes in software testing where each unit component is tested to make sure that software performs as designed. 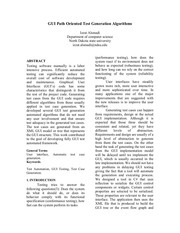 pdf test This is a test document. Types of Software Testing Types	of	Software	Testing	1. 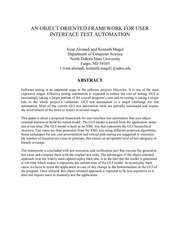 This paper is about a proposed framework for user interface test automation that uses object oriented features to build the tested model. It is a tested deterrent to illicit drug use. It is a tested deterrent to improper medicine use. Next, the simulation model of the system was built in the hydraulic simulation software AMESim, and the models of tested pump, relief valves and check valves were built by HCD library. • It can be done by developers before releasing the build to the testers and post this it is also tested by the testing team to ensure that the build is stable enough to perform the detailed testing.